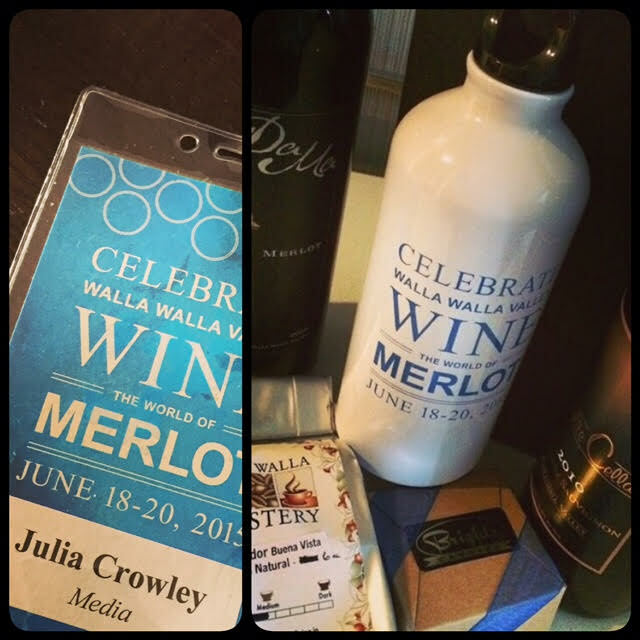 Last June, I attended Celebrate Walla Walla Valley Wine: The World of Merlot, where Merlot took center stage as the star varietal during this annual event which recognizes and applauds local wine producers and growers – and how the Merlot varietal thrives in the Walla Walla Valley. With its inaugural event taking place in 2013, spotlighting Cabernet Sauvignon, more than 300 guests registered for the first-ever Celebrate Walla Walla Valley Wine. Just two years later more than 540 people came from all over the world to experience and explore Merlot at this grand event’s third round of success. 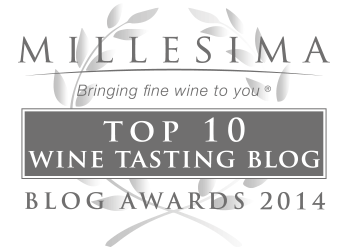 This year, Cabernet Sauvignon will once again be the highlighted varietal. Proven to grow and thrive exceptionally well in the region, wine enthusiasts can once again (or for the first time) embark on Walla Walla for this highly touted celebration June 16-18, 2016 – for details, visit wallawallawine.com/celebrate. Swag greeted me in my room upon check-in – 2 bottles of local wine, a water bottle, local coffee and chocolates. A thoughtful welcome from the Walla Walla Valley Wine Alliance who hosted the media attendees. With a weekend packed-full of incredible events that included guest speakers, winemaker panel tastings, an unrivaled and unforgettable vintage pour event; in addition to, geologically-focused visits to the vineyards, my knowledge of Merlot was positively enriched and enhanced, and my notebook was chock full of notes. We were sampling wine wherever we went. 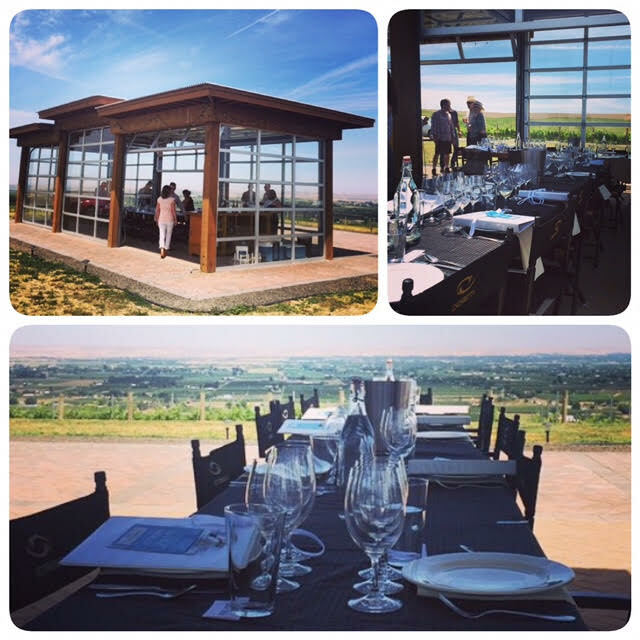 And where there is wine, there is food – allowing us to delve into world-class cuisine created and catered by some of Walla Walla’s most renowned chefs; as well as, giving us the opportunity to experience Walla Walla’s dining scene at some of the city’s most touted restaurants. Prior to attending the Celebrate Walla Walla Valley Wine: The World of Merlot media event, I had never visited Walla Walla. One of the most surprising things about this trip was that this chic, yet charming, little city (with a population of about 30,000) had the most delightfully delectable, pleasantly palatable, agreeably ambrosial, divinely delicious and ultimately unforgettable cuisine I have ever had. A memorable start for 3 food and wine writer’s, Saffron Mediterranean Kitchen set the bar high for a weekend of incredible food and wine in Walla Walla – where there was never an ounce of disappointment. From the moment I arrived, beginning with zingy Sangria’s at downtown Walla Walla’s family-owned Mediterranean-themed restaurant, Saffron, to the morning of my departure when Chef Andrae Bopp of Andrae’s Kitchen forever changed the way I view gas-station food with his remarkable Breakfast Poutine, Walla Walla is like the cuisine capital of the wild wild west. 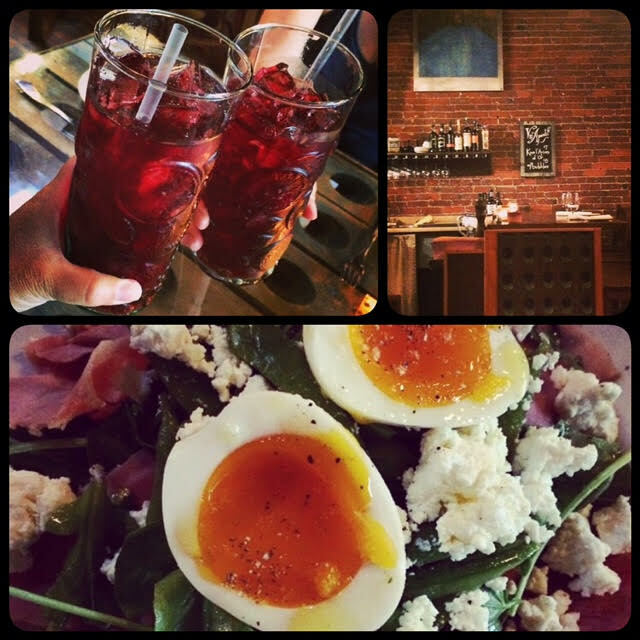 These inspirational and amazing chefs that reside, practice and perfect their craft in the charming small city of Walla Walla may just be one of America’s best kept food lovers’ secret. Exquisite cuisine and ambiance permeated the Celebrate Walla Walla weekend; many of the same restaurants and chefs are participating in the February is for Foodies event. Just imagine my excitement when I received an invitation to attend one of the weekends for the February is for Foodies event in Walla Walla. Memories of exceptionally ethereal foods flooded my senses at the mere thought of returning to Walla Walla; such as, Andrae’s mind-boggling Breakfast Poutine or Whitehouse-Crawford’s perfectly-cooked Halibut (pictured above). Many of the restaurants and chefs that were showcased in the Celebrate Walla Walla Valley Wine event will be participating in the month long February is for Foodies. Also pictured above is Ceviche & Riesling at Basel Cellars (top right) and Watermelon Sorbet at Waterbrook Winery (bottom left). Now in its fourth year, February is for Foodies is an exciting celebration of Walla Walla’s fabulous food scene; featuring cooking demonstrations led by the region’s finest chefs, dining options with prix-fixe menus at some of Walla Walla’s highly acclaimed restaurants (some with the option to add-on locally produced wine pairings), brewery-themed dinners, chocolate pairings, special lodging discounts, and much, much more. 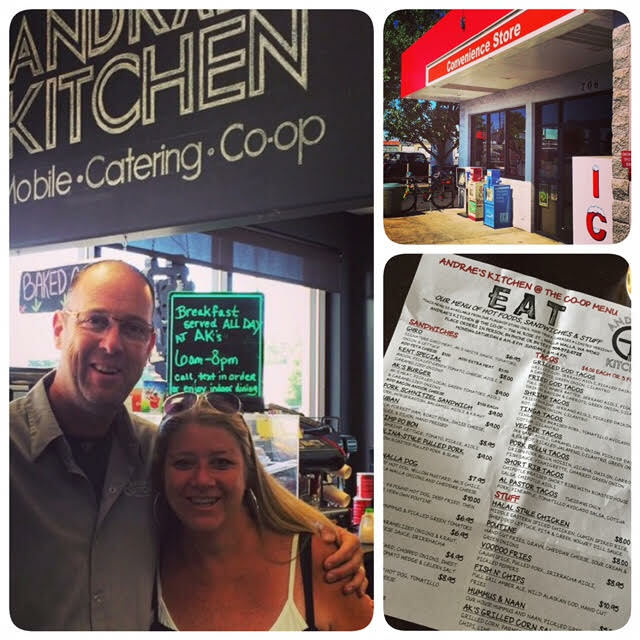 Andrae Bopp and I inside his gas station restaurant just after I reveled in every bite of his amazingly delicious Breakfast Poutine. 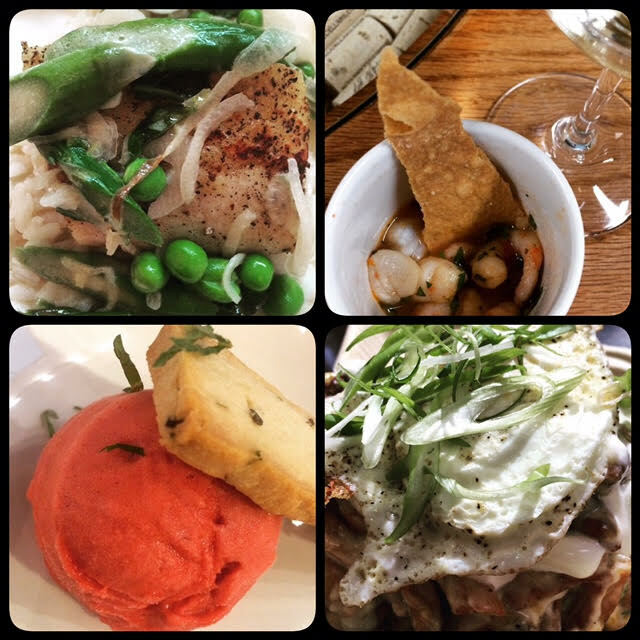 As a huge fan of Andrae Bopp’s impressively delicious cuisine, I decided to head to Walla Walla the first weekend of the February is for Foodies month long event- the weekend of Andrae’s Mexican-centric cooking demonstration. Proving to be a popular selection, his class sold out, so another culinary “journey through Mexico” was added to the schedule the following weekend. I’m also thrilled about the Gastro Bistro Dinner at the Fat Duck Inn – a BYOB four course meal that had me quickly deciding which Walla Walla wine to take with me. 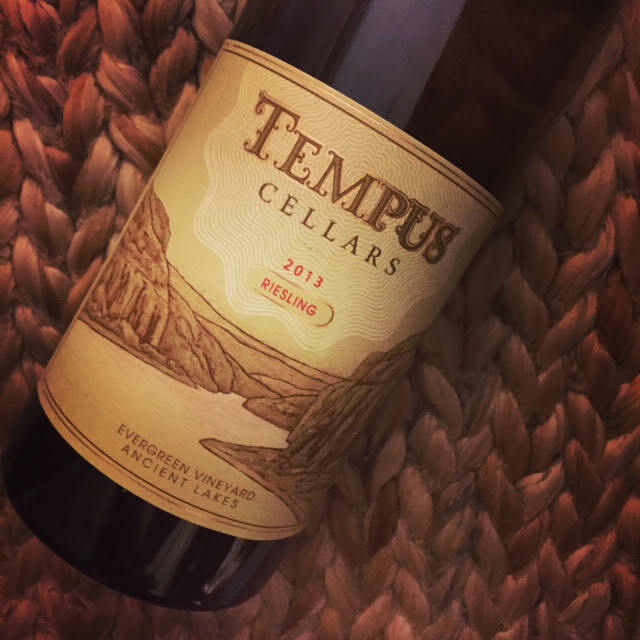 With Riesling being one of the most food-friendly wines, I think I’ll be carefully packing into my suitcase a bottle of the Tempus Cellar 2013 Riesling, one of my favorite wines from the Celebrate Walla Walla event. My wine of choice that I’ll be sharing, sipping and savoring at the Fat Duck Inn’s Gastro Bistro Dinner. With a plethora of refined and splendid events taking place all month long, read through the February is for Foodies website by clicking here, and find the event(s) that will be perfect for you. Thanks to Heather Clark at DVA Advertising and Pubic Relations and Visit Walla Walla for the opportunity to participate in February is for Foodies.